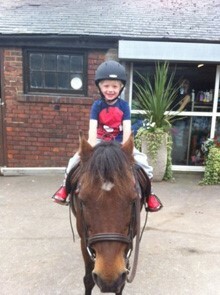 Our horses and ponies are well trained and we never put you on a horse that you don’t feel comfortable with. You have the option to ride different horses to aid your progression. We cater for occasional visitors who want to improve their horse riding ability and for regular riders who want to learn from the beginning, or for those who are coming back to the sport to re-learn their skills and regain their fitness levels. We have a minimum age limit of 2.5 years old; we don’t have a maximum age limit. As long as you are fit and able to get on a horse, you can give it a try! Hats are available to hire for those who just want to give it a try before they buy all the equipment. 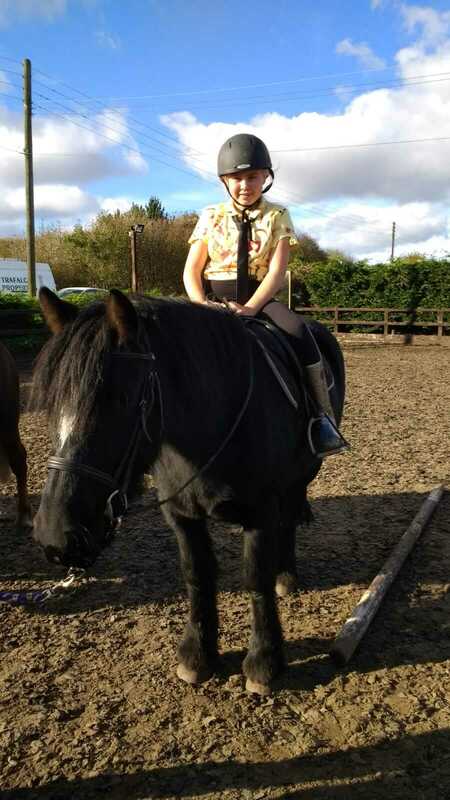 We have a structured schedule of lessons that run every week, keeping riders of a similar standard in groups together. On top of that, we also offer private and semi private lessons that can be booked on adhoc basis. We also have special activities on offer throughout the year. It is important to get your bookings in early to make sure you get the slot you want. We are quite busy and spaces are limited. NB: We have a maximum weight limit of 13 stone. These are individual sessions with your chosen instructor. They can be for any length of time, but you need to remember that they can be quite intense. These lessons are the most effective way to learn to ride and progress quicker, but also the most expensive. Most people chose to have a combination of private and group lessons. Alternatively, you may wish to book private lessons as a Birthday of Christmas present. Adults are quite welcome to join in our general classes and indeed many do. Others however, prefer to ride with others of a similar age and ability. For this reason, some of our lessons are “adult only”, where you can enjoy the opportunity to socialise with other adults as well as improving your riding skills. We offer instructional lessons as well as hacks out. Don’t be afraid to come alone, you will soon feel at home and relaxed with other riders of the same ability. Our main teaching days are Saturday and Sunday where we can provide children with half hour lessons; these give the opportunity for children to learn to ride in groups, combining fun, learning and the opportunity to make new friends. Group Lessons are class lessons which are grouped according to your ability. They start at Beginner Level and work all the way through to Advanced. You will be assessed on your first visit to North Lizard Riding School and will need to give a brief description of your previous ability when booking. Every new rider (or their Guardian if under 16 years) must complete a Rider Registration Form and Code of Conduct. Lessons are booked either in person or by telephoning the Centre on 0191 529 2198 to book at suitable time and date. We ask for a £5.00 deposit at the time of booking to secure your place. Our clients usually book the same time every week or fortnightly. In case of cancellation, please give as much notice as possible so that may reassign the slot. Lessons / Hacks cancelled with more than 24 hours notice will be refunded or carried forward. A £10.00 fee is charged for cancellations with less than 24 hours notice, regardless of cause. Your first lesson at North Lizard Riding School will involve completing a Rider’s Registration Form and Code of Conduct, which will tell us what your experience with horses is and also any medical conditions that we need to know about. This information will aid us in deciding which horse or pony is best suited to you. The Owners and Staff or North Lizard Riding School will not be held responsible for any accident, injury or loss to any person or their property, however this may be caused. A warm jacket or sweatshirt, depending on the weather and some gloves are applicable. A waterproof jacket for the ever changing English weather would be sensible! Footwear should have a small heel. Most trainers and some Wellington Boots have a flat sole and are therefore not suitable, however, our horses do have safety stirrups. We insist that all riders wear current British Safety Standards riding hats. You can hire you a hat if required for a small charge. If your hair is longer than shoulder length, you should make sure it is tied back securely with no clips or slides worn underneath the hat.